My favorite thing in the WORLD is to make something delicious out of scraps. 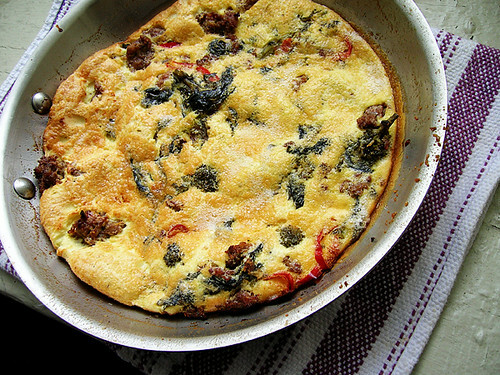 I had a little bit of kale and sausage left over from some pasta that I had at Francesca's Forno, I dressed it up as a savory clafouti. Egg clafoutis are my winter home breakfasts, Tuesday and Thursday, and I'm still deciding if I want butter coffee or actual breakfast on Saturday. Heat a bit of olive oil in an ovenproof skillet over low heat. Toss in the sausage and kale and warm up them up. Blend together the eggs, flour, and milk in a rocket blender for thirty seconds. Pour the eggs over the sausage and kale in the pan. Bake for 25 minutes. Run a heatproof rubber spatula around the edges and under the clafouti to release it from the pan, and cut it into wedges.